Coloring Book Magic – How To Show Off Your Beautiful Coloring! 27th January 2018 by Gilly·Comments Off on Coloring Book Magic – How To Show Off Your Beautiful Coloring! This coloring book post about Mandalas may contain affiliate links - please click here to see the affiliate statement. Coloring Book designs are very popular in the world of coloring, especially those featuring mandalas which are said to promote calm. Artist Cynthia Emerlye, who sadly died last year, has left the coloring book world with a wealth of material to enjoy for many years to come and the designs I am using in this post are hers. Cynthia, who was born in Rhode Island USA and lived in Vermont, was an amazing artist who produced far more than just coloring pages. She was an artist who also used her talent to satisfy the demand for adult coloring. If you click the link above, you can read more about Cynthia and her work. Her wonderful mandala designs, published by the Octopus Publishing Group Ltd, also feature in my latest YouTube film showing how you can make use of all the lovely coloring you have been doing. Please click here to see the film. The film is about how you can use your fabulous coloring in your crafts without destroying the coloring book or cutting it up. The image above is taken from a coloring book called - Flower Mandalas To Colour For Calm Featuring The Original Designs Of Cynthia Emerlye - Copyright Octopus Publishing Group Ltd. It's easy to pass off that coloring book obsession you have as a childish hobby but being an accomplished colorist takes great skill and patience. It also helps people who believe they 'aren't creative', to ease into an artistic hobby that builds confidence in expressing a creative side that may have been supressed for many years. Enjoying using a coloring book is probably the most non-intimidating way to begin artistic expression. You can do it when no-one else is around and keep your coloring book to yourself until you feel more confident about letting others see your work. Although I have never been attracted to adult coloring (because I like to create my own designs), I love seeing what other people produce and how they interpret the designs that artists such as Cynthia Emerlye have created. Adult coloring books have been around since the 60s and possibly even before that but the current boom in coloring started in 2012. It seems to have spawned a crop of colorists whose skills mean that they produce incredibly eye catching results and no two designs look the same once they have been colored. My love of seeing what various colorists produce lead me to wondering what people do with all that work. And it got me thinking of ways to get beautiful adult coloring out on display in everday life without anyone having to tear pages out of a coloring book or spoil them in any way. So I teamed up with colorist Jen Lynch from Suffolk, UK to see what I could do with the work she did using the Mandala designs of Cynthia Emerlye. Two of Jen Lynch's Colored Mandalas from 'Flower Mandalas To Colour For Calm' by Octopus Publishing Group Ltd. If you would like to have this beautiful coloring book, click on the Amazon link to the right. There are 40 designs in all, each one is unique, inspiring and designed to bring calm to the colorist. The designs are truly beautiful and there is also some information about the origin and meaning of mandala designs at the beginning of the book. There are also some helpful hints about coloring. 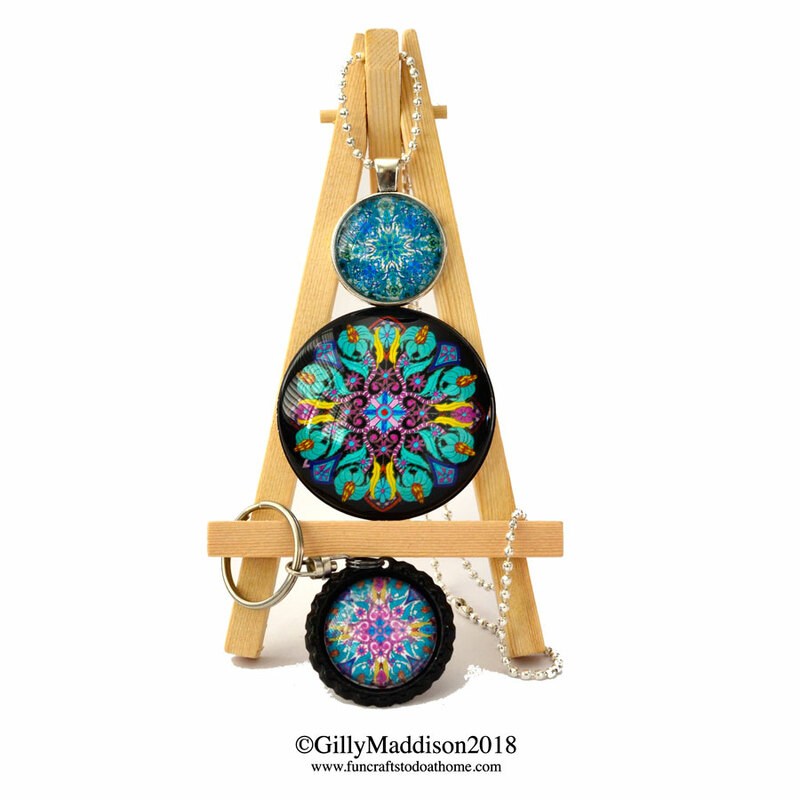 The mandala designs above, scanned from a coloring book, inspired me to think of ways to use them in jewelry and everday objects. And so I set about creating some pieces that would feature the gorgeous designs of Cynthia Emerlye and Jen Lynch's colorful interpretation of them. You can see what I came up with below and if you go to the link higher up the page, you can see the film about how I made the pieces. My hope is that it will inspire people to see their coloring book in a different way; that they will see coloring as a starting point in a wider process and begin taking their work beyond the pages of a coloring book so they can show off their work instead of hiding it away. A beautifully colored Mandala can really fire the imagination when thinking of how it could be used beyond the coloring book. But of course, any design from any coloring book has potential to make a great decoration to be used in craft projects. Whatever you do, you must first look at the copyright information in the coloring book you are using to see who owns it and what permission you may need if you intend to publish pictures of the images on your website. It didn\'t take me long to get a reply from Octopus Publishing Group when I asked if I could make a film using images from Flower Mandalas To Colour For Calm - they were very helpful in stating their terms for using the images. Copyright infringement is a very serious issue and should not be taken lightly - so bear that in mind when scanning images. Are they just for your eyes or beyond? And I think you would run into trouble if you were, for example, trying to sell pendants made using coloring book images if you had not got written permission. Whether you are new to coloring or have lots of books full of your work, I hope you will see the possibilities of what can be done with the finished images beyond being hidden away in books.